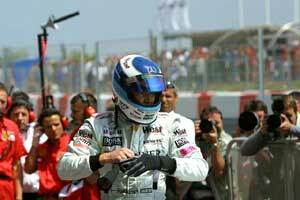 Everbody would like the immensely popular Mika Hakkinen still to be in with a chance of winning his third World Championship title this season, but I fear his chances went up in smoke - literally - when his McLaren-Mercedes suffered clutch failure on the last lap of the Spanish Grand Prix. Alright, alright, I know that a 32 point deficit with 120 points still to play for over 12 races means that Hakkinen still has a theoretical chance. But the reality is that, whatever he achieves in the way of race wins, Michael Schumacher is likely to score second or third places in those same events. Even looking at things optimistically, the best Mika can realistically hope for is to haul back six points a race. Which means he's unlikely to be within striking distance of Michael and his Ferrari before the British Grand Prix - and that assumes he beats not only Schumacher in every race, but that his McLaren-Merc team-mate David Coulthard finishes second each time as well. Historians will doubtless point to the 1976 season in which James Hunt overturned a mid-season 47 point deficit to Niki Lauda and won the title by a single point. The difference there, of course, was that Lauda missed the German, Austrian and Dutch Grands Prix after the horrendous, fiery accident at the Nurburgring which oh-so-nearly cost his life. Hunt was also given an added boost in the final race of the season when Niki - spooked by the treacherously flooded conditions at the Mount Fuji track - withdrew from the race after a single lap. In truth, I doubt whether Schumacher can believe his luck any more than Hunt could a quarter of a century ago. After Interlagos and Imola, Michael was under threat, if not exactly on the ropes. At Barcelona, the McLaren-Mercedes squad let him slip through their fingers. All things being equal - which of course, they never are - Coulthard could have won the race even after stalling on the grid prior to the parade lap, if he hadn't lost even more time with that first corner tangle in amongst the backmarkers. Despite this, I was impressed with the disciplined manner in which the Scot got his head down and chiselled away to play his "get-out-of-jail" card to such controlled and worthwhile effect. To finish the second lap of the race 55.9sec behind the leaders and still take two Championship points reflected a heady blend of good driving and good fortune. His eight point deficit to Schumacher is certainly a much more realistically manageable handicap. Yet the team will not require Hakkinen to play a subservient role until his own chances are effectively extinguished. "In principle we will not ask one driver to drive in a supporting role to the other until he has no chance of winning the title," said Martin Whitmarsh, McLaren's Managing Director, last week. "However, in practical terms you can reach a point where, yes, one of your drivers can still theoretically win the championship, but only if he wins every remaining race. Even so, I think where you get to the point where, to all intents and purposes our second driver in the championship placings had no longer got a reasonable chance, then we will obviously call team orders." If he stays ahead in the points tables, Coulthard will eventually get the same level of support from Hakkinen as he provided in 1998 and 99 when he rode shotgun to the Finn in the closing races of the season after his own chances of winning the championship had faded away. However, this may mean Coulthard has to wait for some time yet before he is given the same sort of priority treatment enjoyed by arch-rival Michael Schumacher at Ferrari. The Italian team has a contract with Schumacher which gives him absolute priority status as team leader, even though his proven superiority over Eddie Irvine and Rubens Barrichello - his respective number twos since he joined Ferrari in 1996 - have seldom seen the need for him to pull rank in any obtrusive fashion. The late Enzo Ferrari, who ruled his company like a medieval fiefdom far removed from today's high-tech environment, would have admired Schumacher's genius behind the wheel. Yet ironically, he would never have countenanced such absolute number one status and instead would have admired McLaren's current open-handedness with its two drivers. There are subtle differences of course. Ferrari loved to pit driver against driver to create a backdrop of internecine strife, reasoning that his hirelings performed better if they were kept on their toes. McLaren's democratic approach is fuelled by a desire to maximize the team's winning potential in every race as well while at the same time playing fair with its two most important employees. In sporting terms this is the fairest way to go about things. Whether it is the most effective way of winning World Championships is another matter, although McLaren insiders believe the team's record of title success speaks for itself.